We’ve hit the ground running in Cape Town, South Africa! Our very first student blog of the summer comes from Dina Ghioto, a rising senior at the University of Georgia. Read about her first impressions below! Well, I was lucky enough to be chosen to contribute to the Go Global blog verrrry early into our trip… the very first day of our trip, to be exact. You could say that I panicked a little when I saw the blog assignments with my name as the first one. I thought, “I don’t have anything to write about yet… We just got here!” But I then realized that I already do have a lot to write about. We did SO much in just one day and it just got me wanting more of this beautiful place. All it took was just one day in Cape Town—one day—and I am already captivated and mesmerized by the beauty, people, culture, and history of this city. Quick summary of today, May 11th. We started out the morning with a quick orientation about what the program is going to look like (basically just awesome). We got our first view of Table Mountain (!!!) as we played a game to learn everyone’s names. Then, we boarded the bus to explore the city via a walking tour given by a very knowledgeable, animated, and giggly Cape Town native named Abraham Rhode. We learned about the apartheid and paid a visit to the District Six Museum. 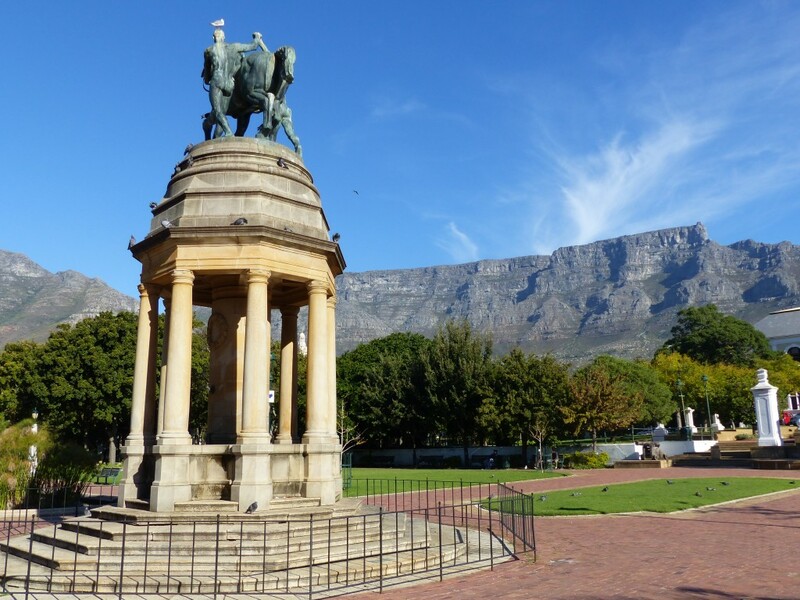 We strolled by many historic sites including the famous city hall balcony (where Nelson Mandela gave his first speeches as a free man and as the president of South Africa), the president’s Cape Town office, the Parliament building, and the Company Botanical Gardens. Our bus made the steep and windy ride up to Signal Hill, just between Table Mountain and the Atlantic Ocean, where we all got our first bird’s eye view of the city and took advantage of the photo op. We then went to the grocery store and watched the sunset on the bus as we returned back to the hotel. We ate a delicious traditional South African dinner at a restaurant called Moyo where we were all given festive white face paintings. We then called it a night and a day well spent and returned back to our hotel. I promise I could write pages about today in so much more detail… that seriously was the short version, believe it or not. What I’m trying to say here is that this was just one day. Just the first one. The tip of the iceberg. I already know everyone’s names (all 31 college students from all over the country) and have taken too many photos of Table Mountain (wait.. there’s no such thing). If every day of this trip is as jam-packed, magical, and pleasantly exhausting as today was, then boy, am I in for the adventure of my life. The inevitable goodbye I will have to say to this enchanting city is already looming ahead just after Day 1, but I won’t let that get me down. As our Go Global bylaws say… let’s spend these next two weeks in Cape Town living with no regrets, diving into every activity and opportunity, and committing to connect with this incredible group of world travelers. Day 1 of Cape Town Direct sounded like a perfect beginning to what will be an incredible two weeks. Stay tuned for more blogs! « Introducing Go Global: Summer 2015!